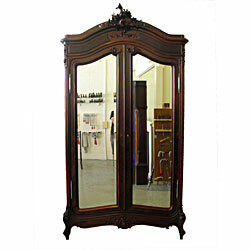 French Armoire in the Louis XV Style, Brazilian Rosewood and Birdseye-Maple veneer on Oak, mid 19th century. This French armoire, in excellent original condition, has been finely veneered and features incised thatch carved details in solid Brazilian Rosewood to the cornice and plinth panels. Original bevelled mirrored doors. Due to the delicate nature of the veneers and carved details, the armoire had suffered areas of veneer losses and broken and missing sections. The heavy mirrored doors also required adjustment to close correctly. The armoire was cleaned to conservation standards and waxed to preserve the original patina.